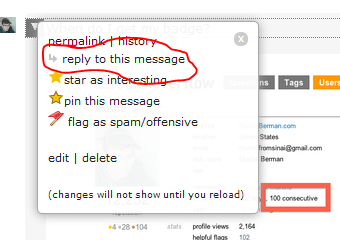 Notifications of new messages in chat land in the global inbox and the links take you to the chat transcript. This is fine, but a lot of my chat communication involves asking other moderators questions, so I often get replies long after I'm gone from chat. I usually want to respond to what they told me or answer one of their questions and there isn't a way to easily do that from the transcript since responding to a specific message involves looking up its ID in the permalink, clicking the "join this room" button and then pasting the chat message ID in the text box. I think this could be simplified by adding the reply arrow to transcript messages. Clicking it would make the user join the chat room and prepopulate the chat message ID they're replying to in the chat box, as if the arrow had been clicked from within the room. – but other than that, it does exactly what you suggested. Not the answer you're looking for? Browse other questions tagged feature-request status-completed chat . Post date in chat message popup? Could we have quick actions in the chat transcript?